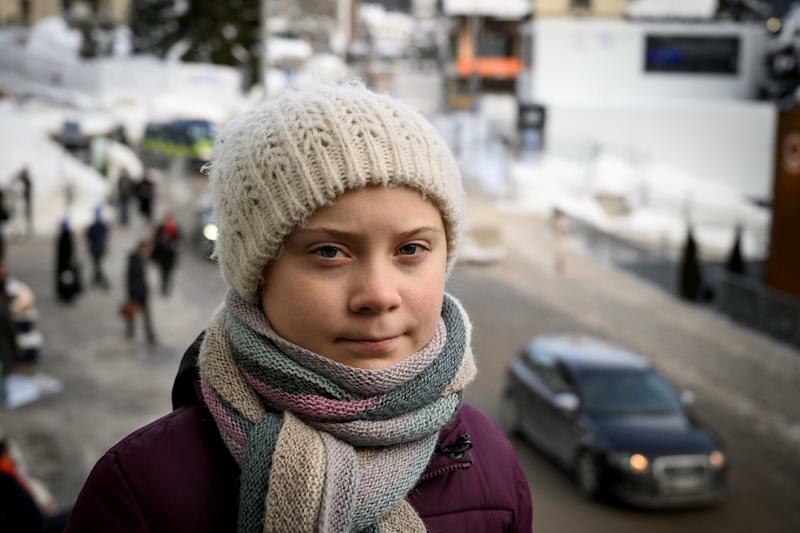 Davos (Switzerland) (AFP) - Her train journey from Sweden took 32 hours, but Greta Thunberg is not tired. The teenager is dead-set in her mission to persuade the global elite in Davos to take climate action. "I would like to talk to people in power," the Swedish crusader told AFP shortly after arriving in Davos for the annual World Economic Forum. Unlike many of the movers and shakers gathered in the Swiss ski resort, Thunberg has not zipped into town for a few quick meetings at luxury hotels. With the train trip from Stockholm, which took a day-and-a-half, Thunberg was making a statement in opposition to many of the Davos elite, who flew in by private jet. "I have stopped flying for climate reasons, because I don't want to say one thing and then do another thing. I want to practise as I preach," she said. "I think it is insane that people are gathered here to talk about the climate and they arrive here in private jet." In Davos, Thunberg is scheduled to speak at several side events and an official WEF discussion on Friday entitled "Preparing for Climate Disruption". But even before she arrived, accompanied by her father, the youngster unleashed a message of outrage to the Davos audience in a video message screened in the WEF Congress Centre on Tuesday. "Some people say we are not doing enough to fight climate change. That is not true, because to not do enough, you have to do something, and the truth is that we are basically not doing anything," she said. But she acknowledged she had no illusions that everyone in Davos would voluntarily heed her call to action. "They have known exactly what priceless values they have been sacrificing to continue making unimaginable amounts of money," she told AFP. She is demanding leaders do whatever it takes to adhere to the Paris climate agreement targets of limiting global temperature rises to below two degrees Celsius (3.6 Fahrenheit) -- and beneath the safer threshold of 1.5 degrees C if at all possible. "I think it is very unfair that the older generations have done this to us and future generations... and that we will have to clean up after them," she said. "Young people need to realise that their future is at risk," she said resolutely, bundled up, with her long blonde braids sticking out from under a woollen hat and scarf against the sub-zero temperatures in Davos. "They need to do something about that and get angry, and form that anger into action," she said, insisting that when children speak up they can have a "huge impact". Thunberg, who looks even younger than her 16 years, has drawn comparison with Pakistani education activist and Nobel Peace Prize laureate Malala Yousafzai. The Swede first grabbed the spotlight when she began staging "school strikes for the climate" last August, skipping school each Friday to protest in front of the Swedish parliament. "Why should I be studying for a future, which may be no more, and when no one is doing anything to save that future?" she said in Davos. "I am too young, I can't vote, but I have to go to school, so this is a way to make my voice heard," adding a measure of surprise at how far her one-girl protest has gone. "I think it is incredible and that it has spread so far, and that people in all continents except Antarctica are climate-striking from school," she said. "I didn't expect it to be that big."